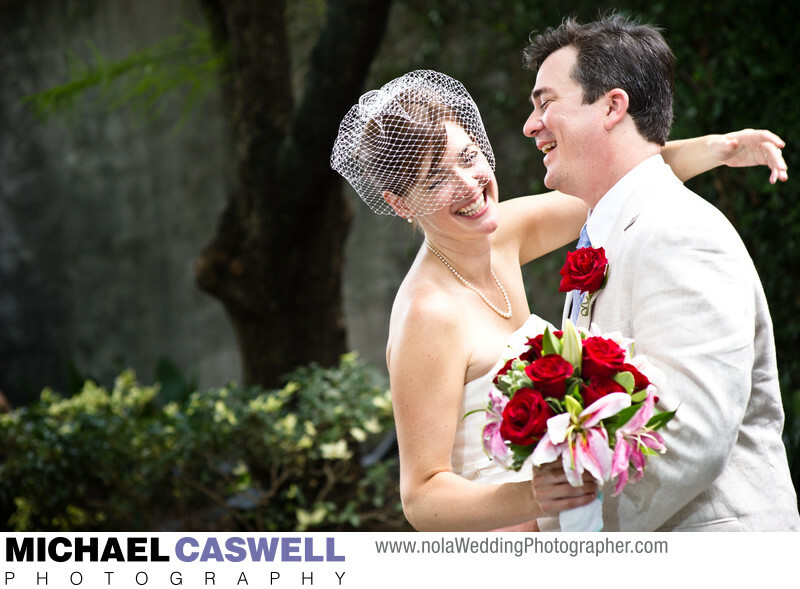 What's the Best Start Time for a New Orleans Wedding? 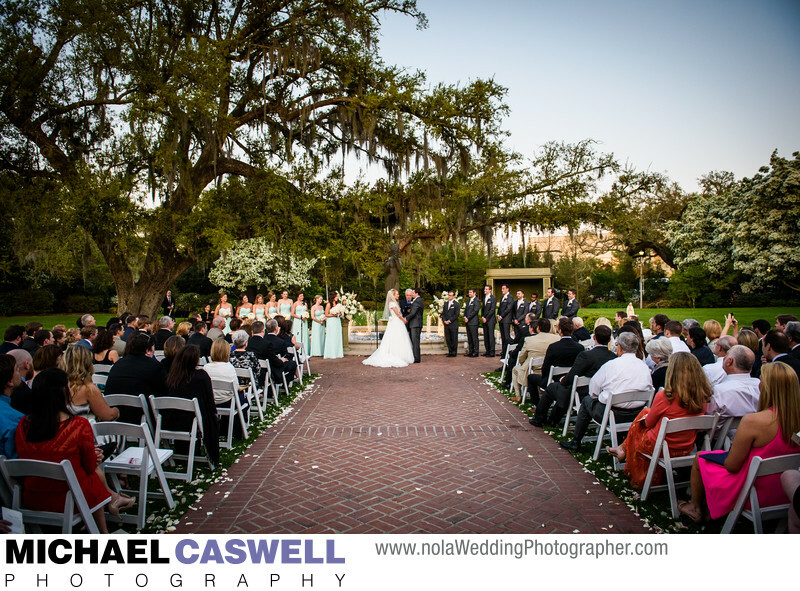 What is the Ideal Time for my Outdoor Wedding Ceremony? There are usually numerous factors that go into the decision of what time your wedding ceremony will begin. Some of these may be fairly rigid and logistical in nature, such as the venue(s) having only certain specific time slots available on your chosen date. Others may be more sentimental, like the thought of exchanging vows in an outdoor setting right at sunset. Or perhaps you want the reception to end at a time that is not too early or too late, so you base your ceremony start time off of that. The purpose of this article is to add yet another element of wedding day timing for your consideration… the best light for photography, especially with regards to an outdoor ceremony. While I cannot directly answer that question for you, as any selected time has some tradeoffs to consider, I hope to give you the information you need to make an informed decision if your ceremony start time is flexible. Several years ago, Sprint ran a series of humorous commercials with themes of “what if _____ ran the world?”, which featured people from various industries inserted into common life situations. The one entitled What if Film Crews Ran the World, which portrays a group of Hollywood filmmakers running a couple’s wedding was, of course, my favorite. I particularly could relate to the part midway through when a cinematographer, anxiously pacing through the venue as the various members of the crew work through resolving some issues that are delaying the start of the ceremony, implores them (via his Sprint wireless device of course), “look, we’ve got to go NOW, the light’s perfect!”. Wedding photographers and videographers often find themselves in this kind of situation, as few things will get us more excited than beautiful light! Though it is our job to produce the best images possible for our couples in whatever the lighting happens to be, it goes without saying that some lighting conditions will aid in the creation of much more pleasing imagery, while less favorable conditions can be a hinderance. Unfavorable light can't be labeled with an blanket statement such as, "the light at 1pm is always bad." While, yes, the light during midday will have a much greater chance of being difficult to work with, you must consider the other variables of the particular area we are shooting in, and in some cases midday light can be great! To avoid getting too technical, I will instead just describe a few situations that can interfere with the goal of creating good pictures. 1) Direct sun in front of and above the subjects, hitting their faces. This creates harsh, dark shadows and also results in squinty eyes. 2) Strong backlighting (subjects are in the shade, but the background is in full direct sun). While there is more than enough light in this situation to get a good exposure on the subjects, the much more brightly-lit background is the problem, as the camera cannot capture such a huge difference in light levels. In other words, exposing for the subjects will result in a completely blown-out background (and the bright background may also somewhat wash out the subjects). This can be addressed by adding light to the subjects (with flash), though this can be impractical and ineffective for a large scene such as a wedding ceremony. Often the only alternative is to pick a "middle ground" exposure as a compromise. 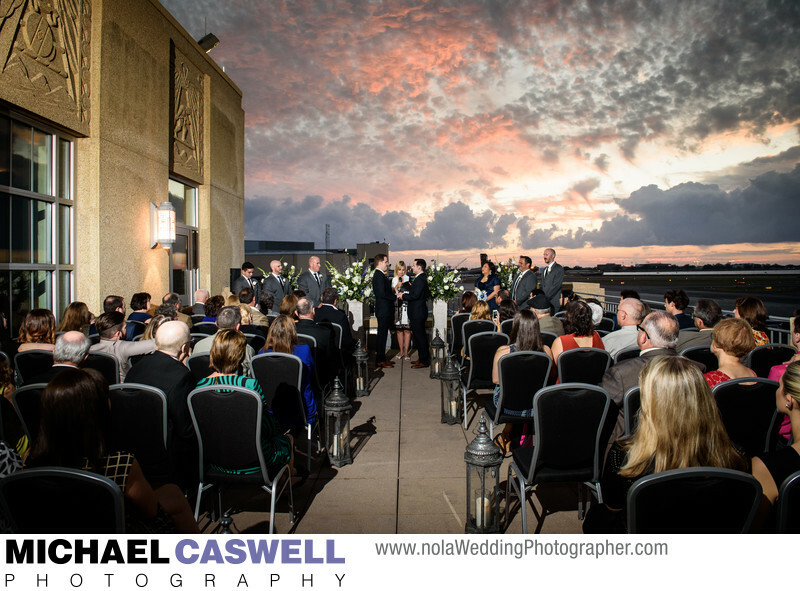 Ironically, for one recent ceremony, backlighting worked to our advantage. The bride was concerned that, although her venue was a beautiful and historic plantation home in south Louisiana, the surrounding area was all developed, with a highway and some rather drab looking commercial and industrial buildings off in the distance of what would be the background of her ceremony photos. However, during a preliminary visit to the site during the couple's engagement portrait, I observed that because the ceremony would be taking place under a large tree and, at that time of day, within the shadow of the plantation home, while at the same time the background would be fully lit by the late afternoon sun, the result would be that the undesirable background would be mostly blown out to white. So, in this particular instance, a lighting situation that would typically be described as far from ideal ended up being perfect in terms of addressing the bride's main concern. But more often than not, a backlit situation is something to avoid if at all possible, unless it's being used intentionally for a particular effect. 3) Sun/shadow transition line passing through the scene. Similar to the above, but even more difficult to work with, when a shadow is being cast by a nearby building or other large object, and the edge of the shadow crosses directly through the ceremony area, it results part of the scene being lit with full sun and the other part being in shade. In its most difficult incarnation, this sun/shadow line passes right through the spot where the couple is standing, perhaps even crossing right through them. 4) Dappled light. While the relative shade of a large tree can offer relief from the midday sun, light filtering through the trees can create prominent bright spots on subjects. This is easily recognizable when you approach such an area, as you can see the distinct pattern of spots being projected onto the ground. The romantic notion of a sunset ceremony is enticing to some couples, but in many cases it's actually not ideal in terms of the best light for good photographs. Because many outdoor weddings in New Orleans take place in French Quarter courtyards, the somewhat enclosed nature of these spaces can make them quite dark at sunset, and furthermore also eliminates much of the actual visual appeal of a sunset ceremony from the perspective of you and your guests, since the buildings obscure much of the view of the sunset itself. A more open outdoor area will possibly be better suited to take advantage of a nice sunset. With the sun setting directly behind the couple, with some supplemental lighting added it can create a stunningly beautiful visual effect in the background! And if the western sky of the setting sun is facing couple, the soft and warm light at that particular moment is often absolutely perfect, though the downside is that this window of great light is very brief, rapidly diminishing as the sun dips below the horizon. And for this reason, it can be a bit risky to schedule a ceremony to begin right at sunset, as weddings often end up starting a little late, and this brief period of excellent light can be gone by then. Of course, I can still capture beautiful images even in the dark through the use of lighting equipment, the overall look of the images will be different from daytime shots. In short, if you have a strong desire for your ceremony to take place at sunset, and have a suitable outdoor location to take advantage of it, consider actually scheduling your ceremony to start 10-15 minutes before the sunset time. If all goes well in terms of starting on time, your ceremony will be ending right as the sun is setting. And if we end up starting a few minutes late, we'll still have good light to shoot with. Setting aside the varying influence of cloud cover and the shade of buildings or natural land features, you can look at each day as having fantastic light very early in the morning, which then progresses to harsh and difficult light late morning through early afternoon, gradually improving as the sun gets lower in the sky, concluding with another brief period of great light just before sunset. Those in the photography and filmmaking craft refer to “magic hour” or “golden hour”, which is that period of time right after sunrise and right before sunset that offers pleasingly soft light to work with. Though colloquially defined as being an hour in length, it’s actually usually shorter than that and varies depending on season and distance from the equator. In a southern U.S. city such as New Orleans, the best light will typically be that last 30 minutes before sunset. The best time for an outdoor wedding ceremony is 30 minutes before sunset then, right? Well, there are a few other factors to consider. In particular, if you plan to do couple portraits and/or formal group shots outside afterward, it will be just about dark by the end of the ceremony. My lighting equipment can provide good exposure for the subjects, but the later past sunset we shoot, the more “evening-like” the background will look. So if post-ceremony outdoor portraits in daylight are important to you, you’ll need to move up the start time to about 45-60 minutes before sunset, which also provides some padding in case the start is delayed. Alternatively, you can considering having a "first look" (where the couple sees each other before the ceremony), which adds significant flexibility to the timeline. Now, you may be wondering how this all works if you are doing an outdoor first look and portraits before the ceremony, since if your ceremony were set to start 30 minutes before sunset, the portraits would likely end up being an hour or two earlier, and thus further away from the ideal light conditions. While magic hour is the most cooperative light to work with in most instances, because with portraits we have flexibility in picking locations and shooting direction (unlike the ceremony itself, which usually cannot move), I generally do not worry much about shooting portraits earlier. I can usually find a suitable area of shade for these photographs, and additionally, the sun can sometimes be utilized to create some beautifully accenting rim lighting. If your ceremony is taking place in a church or other indoor location, daylight may still be a concern, particularly if you want to do your formal group shots and bride & groom portraits outside. One common issue with weddings that take place between November and March is that with daylight saving time not in effect, it gets dark quite early (5:00 - 6:00). If you are unable to schedule your ceremony earlier (or if this would throw off the timing of the reception too much), often the only way to be able to get outdoor portraits with daylight is to have a first look and do the portraits well before the ceremony. If you are getting married during these months, be sure to factor this in to your plans. If your ceremony is set for earlier or later than that last half hour before sunset, don’t sweat it! While that may be the ideal time for outdoor pictures, it certainly does not mean that spectacular images cannot be produced at other times. In some cases it may be unavoidable that an outdoor ceremony and/or portraits take place after it gets dark. It might even be your preference if you want that particular look! Don’t fret over this, as beautifully romantic photographs can still be produced in these conditions, using a combination of the venue’s ambient lighting, candles, lanterns, and other decorative elements, as well as my own lighting equipment. That's all part of the reason why you should hire an experienced photographer who is comfortable shooting in difficult lighting conditions. If daylight photographs are important to you, be sure to give consideration to the sunset time on your wedding day before your plans are set in stone. Also, be aware that weddings can, and often do, run a bit later than expected, so be sure to incorporate some padding into your timeline. Feel free to call or email me to discuss any lighting, logistical, or timing concerns you may have.